The Go the EXTRA Mile program is the largest and most ambitious city-wide hospitality training program in Denver's history. An all-day training that happens 2-3 times a year with 55 front line hospitality employees in attendance. The monthly Go the EXTRA Mile award, presented to a partner of the Denver community who has gone beyond the call of duty while working in the front line. The Go the EXTRA Mile Road Shows, if you have 20 employees who would like to receive our training we will come to you and customize the training to your company's desires. Make exceptional hospitality a way of life in The Mile High City! Keep visitors coming back and spending money! Front-Line Hospitality Training is an all-day session designed for those members of your staff that come in direct contact with customers. Our day will conclude with all attendees receiving "Go the EXTRA Mile" certification. You need only take the training once. To stay up-to-date on the latest visitor statistics, click here! The Go the EXTRA Mile Awards are given to those hospitality front line representatives who go above and beyond in their interaction with customers. This is your chance to express your appreciation for their superior service! Nominate a front-line representative from your company (or anyone from whom you have received excellent service.) Nominations will be reviewed and the winner will be presented with a fun prize such as an overnight stay in a Denver hotel/resort, tickets to a major league sporting event or dinner for two at a fabulous restaurant. The winner is also recognized and invited to the VISIT DENVER Annual Partnership Dinner. Your nomination! We also ask that the winner&apos;s employer agree to provide one additional incentive to this person. Suggestions include free parking for a month, a day off, money or a gift certificate. Let us come to you! We&apos;ll provide training to your front-line employees about key Denver facts, new attractions and upcoming conventions. Please note that we ask for a minimum of 20 employees to be in attendance to conduct a Road Show. Schedule a Road Show for your group. Check out a list of upcoming conventions being held in The Mile High City, including host hotels and approximate number of attendees. Browse a list of VISIT DENVER partners, conveniently sorted alphabetically and by business or organization type. Find local resources quick! 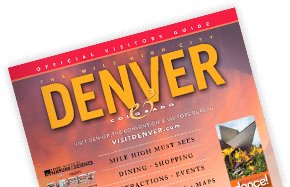 Enjoy deals and discounts from other VISIT DENVER partners including restaurants, attractions, hotels and more! Denver is rolling out the red carpet for visitors with Go the EXTRA Mile providing city-wide hospitality training, awards and customized training road shows. Denver continues to bring home the hardware in a number of areas with recognition for biking, fitness, cuisine, conventions, music venues and more. Annual dinner open to partnership in order to raise funds for the VISIT DENVER Foundation, awarding scholarships to Denver students. Tourism is the second largest industry in the City & County of Denver, and in the State of Colorado.